Posted in Bright Ideas / Research on March 15, 2019. It’s clear, local link building is a vital factor when trying to achieve success in local rankings. But, how do leading local marketers approach getting backlinks, and what do they think makes a good local link? 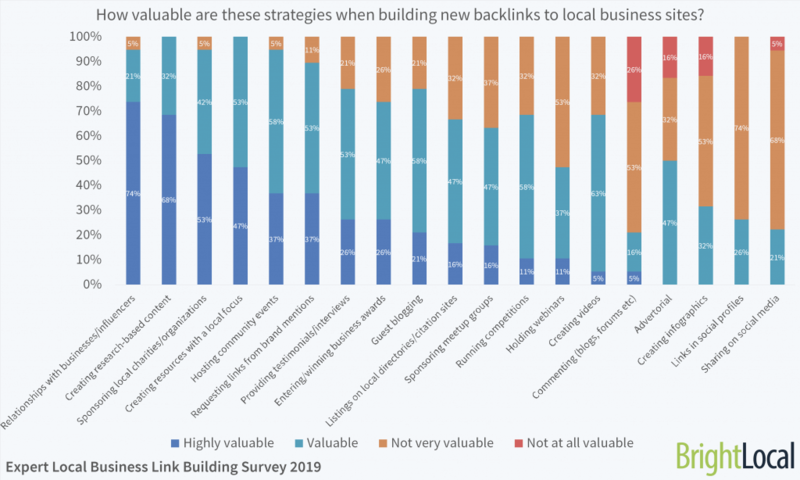 To find out, we asked a small group of local SEO experts to share their opinions and experiences of building local business backlinks – and their insights are fascinating. 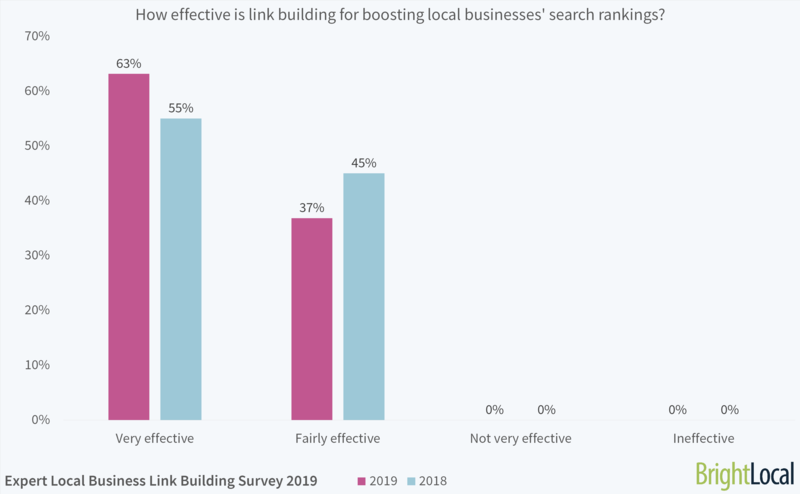 This is the second year we’ve run this report, so this year, we’ve compared both year’s findings to see what’s changed in local link building. To note, there was a slightly different number of experts taking part this year, so small rises or drops may be attributed to this, rather than big link building trend shifts. A huge thank you to the SEO experts for sharing their excellent insights, including Megan Lindsey and Cory Agular from Search Influence. If you have any ideas or experiences you’d like to share about your local link building experiences, please let us know in the comments below. Is link building a task you prioritize for your local business clients? How effective is link building for boosting local businesses’ search rankings? Are links more or less important to local business search rankings than 12 months ago? Will acquiring links become easier or more difficult this year? What is the biggest problem or misconception about the value of links to local SEO? What are the most valuable link sources for boosting search rankings for local businesses? If a local business asked you how many links they should aim to get each month, what would you say? How valuable are the following strategies when building new backlinks to local business sites? How valuable are the following attributes when building new backlinks to local business sites? Approximately how much should local businesses aim to be spending to acquire each link? 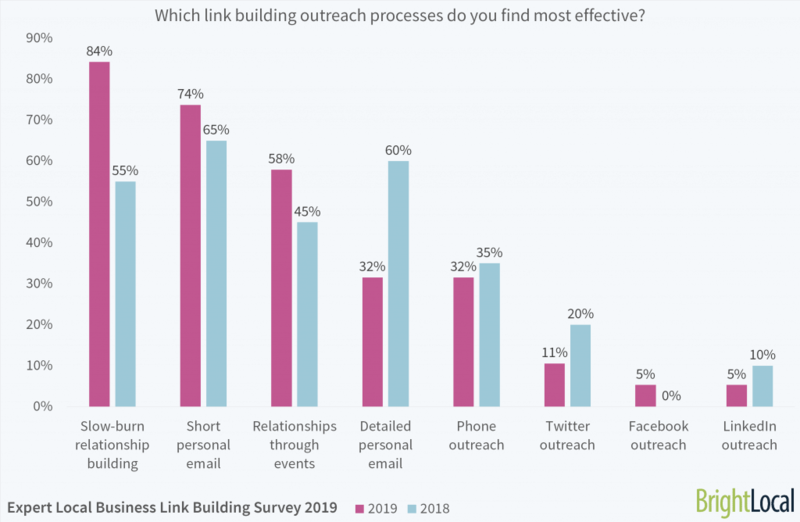 Which link building outreach processes do you find most effective? In your opinion, what makes a local business link building campaign successful? Since last year, there has been a slight growth in the proportion of experts reporting link building as a priority for their clients. 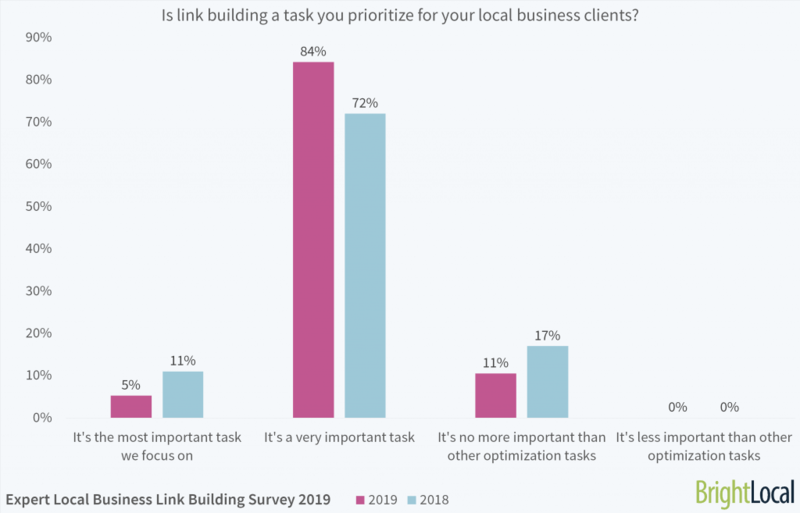 While there was a slight dip in the number of experts saying that it isn’t more important than other optimization tasks, it’s clear that for most, link building is key to local SEO success. And it’s no wonder the experts put link building first. In the latest Moz Local Search Ranking Factors Survey, link signals were rated the most important localized organic ranking factor, and the second most important local pack factor. Meh, links! With respect to local SEO, quality links are the competitive difference-maker. It's not that citations, content, technical, etc, aren't important, they are. But links tend to make the difference. And when I say "quality," I don't mean Domain Authority. Focus on local and topically relevant links. Give people a reason to link to your pages beyond begging, bartering, and buying. How effective is link building for boosting local businesses' search rankings? Link building is an effective way to boost local businesses’ performance in SERPs. 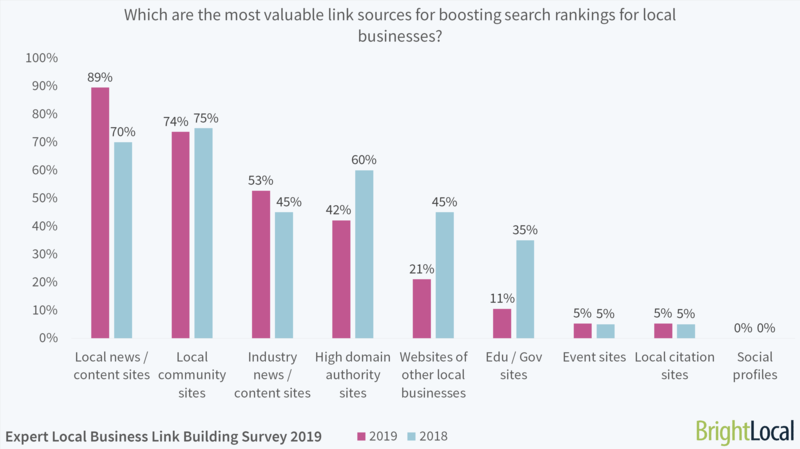 Every expert in the panel agreed link building boosts local search rankings, with more experts saying this year that this is ‘very effective’. And, if you’re looking to rank outside of your local area, Brian Barwig wrote a great blog here to help. Link building is expensive, but with consistent investment, search visibility can increase, sometimes dramatically. I think we need to completely revamp link building and really work on brand building instead. The links follow. Building the brand builds the business's reputation in their community – which will reap more benefits than just a link. You can read all of the SEO studies you want. At the end of the day links are still the main driver after you have your ducks in a row. 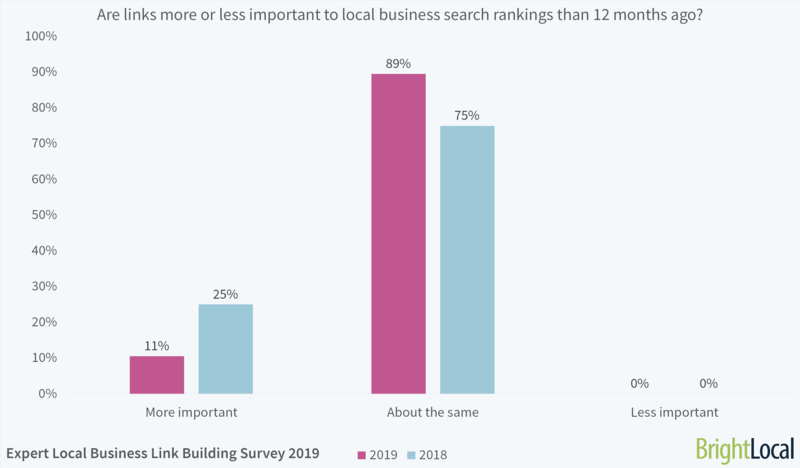 Links remain as important to local search rankings as they were in 2018. This year, 11% of the panel report link building being more important than last year, while in 2018, 25% of the experts said it had become more important. But with a growing number of experts believing link building to be very effective at boosting rankings, it’s unlikely link building could be much more important to local search rankings. I hate the term "link building" – instead we encourage clients to build their brands and work hard to become the best business they can be, with high customer ratings. Get involved in their communities and spread that community karma around. This leads to structured and unstructured citations and links. 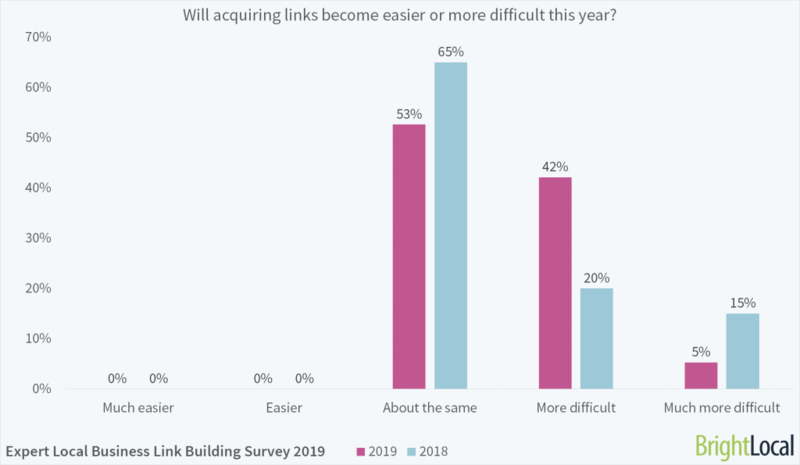 For the second year running, it seems like link building’s set to get tougher. Securing quality backlinks can be time-consuming, and often leads to rejection or being ignored. But, when you do achieve that ever-important link, it can feel pretty rewarding! For local businesses with low budgets and limited time, it may be tempting to prioritize more immediately gratifying marketing tactics. While local businesses may be less likely to have multiple links, they may be a little more aware of the benefits of citations and reviews to your local search rankings. This means that those building great backlinks have a great opportunity to stand out from the crowd. The biggest problem is getting value for budget on the SMB side. Often they just don't have the monthly budgets necessary to move the needle in competitive industries in competitive markets. On the other side, when you have a larger link building engagement it requires the ability to do everything you are already doing with link building bigger, stronger and faster. That requires really focusing on your operations (including people operations) and what you can automate. We can do research for clients, make contacts for them and give recommendations. However, the business and its staff need to take an active role in helping to build their brand via local links and citations within their market area. We rarely take on clients who don't have the necessary budget and buy in for local brand building. Don't be afraid if you get told no. Keep trying. When it comes to outreach quantity can make a difference. Experts were asked to share their thoughts. That we still talk about "links" at all. Local businesses should be much more concerned with building quality relationships and mentions of their brand as opposed to links themselves. Google has gotten incredibly good at identifying semantic relationships between entities. IMO they no longer need the "a href" to make that logical connection. The biggest misconception is that Google doesn't want your business to build links. The reason links improve visibility is because Google values them as a proxy for how valuable and authoritative a local business is for what they do and where they serve. Links don't appear to impact the local pack results nearly as much as they impact organic rankings. The biggest misconceptions are: 1) That getting good links is optional; 2) That the client doesn't need to be involved, and 3) That citation-building is enough. That there is a focus on volume. In fact, quality and relevance of links are far more important. The biggest misconception is that acquiring backlinks can be scaled. I often hear people using the word "scale" in the same sentence as link building. To do it effectively and in a way that Google is OK with you need to put in the time, effort and expertise. That no-followed links aren't worthwhile. Heck, even Gary Ilyse from Google said that publicly: "Nofollow links don't have value." The experts were able to choose up to three choices. In the last year, local news sites have improved in perception among the experts, now being the most valued among the panel. Agencies should be aware of the local sites that present the biggest opportunity for the client’s local area – beyond the biggest local paper. Interestingly, .edu and .gov sites saw a drop. Could this be in part down to the comparable difficulty in achieving these links? High domain authority sites are also less important compared to last year. While many local business clients may be impressed with a backlink on a high DA site, ultimately, it’s better to focus on the local or industry-specific sites that potential customers use. Instead of thinking, "We need links" think about how to build a better local brand. Have you identified who your target customers are and what their interests are? There's a myriad of ways to get involved with the local community that align with the interests of your potential customers. Build a better, local brand. A business should be genuinely concerned about and involved in their local community. Beyond a typical sponsorship, a business may be able to utilize its skill set and resources to help local non-profits with specific needs they have. It should also be a priority for the business to be a true expert in their industry. Their website can help convey this by providing quality answers to questions potential customers are out there searching for. The mindset to have when doing local link building is the "get by giving away" approach where there's never any clues or hints about your hidden agenda. Give to the community and neighboring businesses with authenticity and you almost never need to even ask for the link. Spend more time researching link opps, so you can find a wide variety. There's a link opportunity for everyone, even for a deadbeat client. Do not stop at citations. Links have always been core to marketing/SEO. Yes, citations are easy to get, but a nice steady stream of quality links from other sources is great. You get an A+ grade if you are building links that generate traffic as well. Firstly, it's not about volume, it's about quality, particularly for local businesses. Secondly, it completely varies by category. In a non-competitive space like a long-tail machine parts manufacturer, a couple of quality links a year could make a meaningful difference to their business. In a hyper-competitive space like personal injury law, those firms should probably be aiming for a half-dozen to a dozen high-quality links per month. It varies greatly based on the industry. We have some clients that only really get a handful of [good] links a year and do really well with that. Others are stacked up against competitors that have hundreds of linking domains. Don't get too caught up in numbers. 50 directory links might not be as powerful as one sponsorship link. It's really about quality over quantity with link building. Aim for links that your competitors will have a hard time getting on highly authoritative pages. How many woodchucks would a woodchuck chuck if a woodchuck could chuck wood? I would look at the industry average and maybe even at the local level per location to come with a 30,000ft view of the landscape, and then dig into the intersecting opportunities of competitor-earned links to focus link efforts where it puts our location into the semantic web and not out in left field. There is no such thing as link velocity! SEOs made this term up in the 2000s. The right answer here is that there is no magic number, in some industries and markets more links may be needed. Focus instead, on the question, "Will getting more links build the quality traffic to my site?" That will depend on the client's vertical, their market, and what other competition priorities they are facing. There isn't a one-size-fits-all for this. It really depends on the industry. A truly local business doesn't need more than a few to a handful each month. Hyperlocal businesses without much competition can get as few links as a handful a year and be competitive. There is no definitive answer. It depends upon the niche, location, and competition. Some businesses need to build dozens of links per month in order to stay competitive and rank in the Local Pack. Other businesses may have minimal competition or reside in a small market and not need anything more than directory links. In my opinion, the best approach is to create link worthy content, sponsor local activities in the community, and outreach for links every month. This year, building relationships with local businesses and influencers has become the most highly-valued local link building strategy. Creating research-based content has also become more valued by link building experts. Local businesses can attract a lot of links by demonstrating their expertise, and providing original insights into industry-relevant topics. However, this can require a higher time investment than some of the other ‘paid for’ strategies. It's helpful when the business is actively involved in the local community, takes care of their customers, and is focused on growing their brand. A challenge we've seen when it comes to digital marketers understanding the value of links is the idea that pursued links are somehow more valuable than earned links. The whole idea of organic is to build content that's so helpful that others who find it (through good keyword research and page design strategy) want to curate, reference and link to it. Outreach, such as how this study was built, should be for contribution, not to ask for a link. I think some of the most valuable links my clients have received is awards they have won because they aren't just a link. They come with bragging rights that can help bring in more conversions. If you are doing things the right way, link opportunities will happen naturally in the long run. For instance, if you use HARO a lot, then people will start coming to you for interviews. If you sponsor a local event, others may reach out to you. If you are on a webinar, another host may reach out to you. If you do nothing, expect nothing. "Guest blogging" done right still does and still will be incredibly effective despite Google's indications to the contrary. Getting a regular column in your local newspaper or neighborhood blog as a subject matter expert is exactly the kind of content that Google should (and does) want to reward. Far more importantly: you're getting in front of your exact target customer base, so what do you care if Google rewards or punishes you for that behavior? If the content is topically-relevant to the source website on which it's published, it still matters and unless you "fish with dynamite" the odds that Google would ever detect let alone punish that kind of legitimate brand building is preposterous. There is so much variation in link building depending on the size and type of local business. Each business vertical and type will have its own strengths and weaknesses. For us, we focus heavily on research, talking about our results (positive and negative), regularly iterating on our methods and scaling what we can (research and prospecting) as aggressively as possible. It can be a challenge doing this while still maintaining tight quality control and requires investing in the people operations necessary to continue to grow the program. All four of the above attributes were valued by the majority of the panel. Quality and authority is the most important attribute of a good local backlink. However, remember to split these across a diverse range of sources, rather than just one great source. As a heuristic, aim for as many quality inbound links a possible. That said, a lot of local businesses miss the boat on link building, so the bar is often low on what it actually takes to create a defensible advantage in the SERPs. You need diversity across your incoming backlinks; a natural backlink profile includes links from many different root domains with diverse keywords to various pages of your website. There are certainly quick and easy ways to get backlinks to a website, but they’re likely to be low-quality links. You need to follow a process or strategy and know exactly what it is you want from every backlink. But please remember that any links you acquire, need to be natural and relevant. It's 2019 and I still find myself educating customers on basic concepts like Quality > Quantity on a regular basis. Of course, there’s no one size fits all answer for this. Respondents suggested between $100 to $1,000, but as any local marketer will know, it depends. I would never think in these terms or want my clients to think in these terms. I wouldn't think of it that way. I'd think in terms of: how badly do you want "free" visibility, and would you rather invest money or invest time? Any costs for link building should be the labor to acquire them and not payment to webmasters. Bought links are problematic in a few ways. 1. They're against Google's guidelines. 2. A webmaster can arbitrarily remove them. 3. earned links are more likely to be high value. Depending on tactics, a link may be acquired in minutes or hours and therefore may range in cost from tens to thousands of dollars – well worth it if you're in a competitive category. This typically depends on the quality of the link you're trying to get. If you need to create an interactive resource that will earn links it will require a lot of development work, research, and design time. This could earn 10-20 links but the development could cost thousands to create the resource plus the time it takes to do outreach. Instead of focusing on how much you should pay for a link, really think about what resource you can create that will be better than anything out there. It should add long-term value to your customers, your website, and earn links. It's important that businesses measure paid placement fees and resource time when looking at costs when it comes to link building. For example, a $500 lawyers.com link may have required 2 hours of phone calls and an hour of filling out information, or 8 hours of time from a content writer. If one had to aim for a per link maximum cost, they might use the following criteria and create a tiered model based on the value: 1) Likelihood of receiving referral traffic; 2) Likelihood of getting a massive amount of local eyeballs on the content (such as local news); and 3) Likelihood of the linking page earning links on its own. Perhaps $200 to $400 for each of those criteria met may be a good starting point. A slow-burn approach to building relationships is the most effective outreach approach among this year’s panel. Focusing on building real, reciprocal relationships over time pays dividends – but, of course, takes time. Interestingly, detailed personal emails are significantly less valued among experts than last year, while short personal emails have become slightly more effective. Popular websites and contacts are likely to receive a high number of outreach requests, so perhaps it’s more valuable to receive shorter, to-the-point, messages. Look at it as networking your business, and approach potential partners with that same mindset. Don't use the word "link" right away – create a great relationship that encourages sharing of customers/clients/information. Links should be viewed as an outcome of a relationship, not as a transactional currency. It depends on the specific link itself. If it's on the homepage of your local newspaper, you might spend years building the relationship. If it's a casual mention in the social feed of an influencer because you produced a really amazing piece of content, you might not even contact the person directly; it might just happen organically. Your local business should strive to become an institution in your community. Most business owners understand this when it comes to building up reviews, sponsoring local community events and charities, and participating in their BIA. Where they miss the boat is translating that goodwill into a program that pays dividends online. Link building is about building relationships, online, at scale. Long term relationships with publishers that help grow content distribution. Buy in and active participation from the business and its staff. A steady increase in quality and relevant referring domains, and making sure that the backlink profile is well-rounded and diverse. Creating meaningful relationships, attaining links, creating buzz/traffic to the website or asset you are promoting, and most of all - turning web traffic into a client/sale for the business. Do the links help achieve a business objective? If there's a direct impact on the business's bottom line whether it's as a result of improved rankings and traffic from a link building campaign or an increase in business because they were "exposed" to the brand during the campaign. Years and years of building relationships with influencers, reporters, and authors. You know you're successful when the links you build increase your rankings, and in turn, your form and phone leads. If you can get links that are local, relevant, driving traffic and helping your overall SEO efforts, then you have done a good job. At the end of the day, link building, is only one of the activities you should focus on. Build out a strategy, define where you want to target your link acquisition, and execute. For local businesses, link building can be incredibly helpful in standing out from the crowd. Links directly impact both local pack, and localized organic rankings, and yet, aren’t a focus for many local businesses. 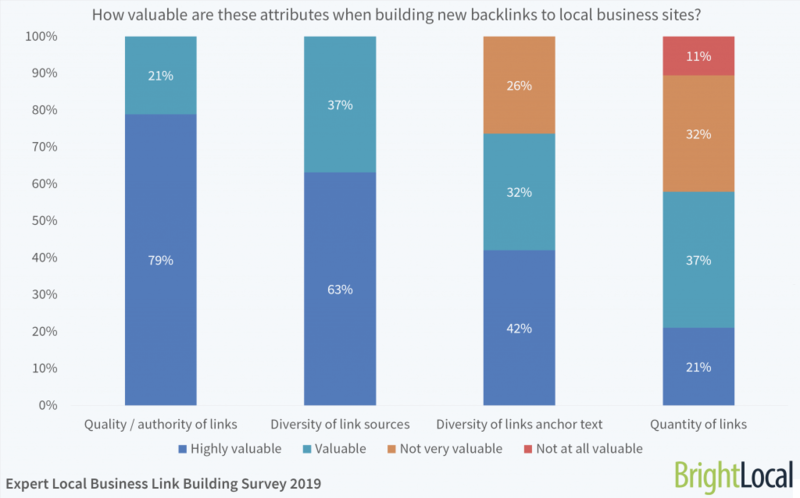 It’s great to see that local SEO experts prioritize link building – but do most local businesses? We hope the insights above help marketers demonstrate the importance of links to their local business clients. Link building can be tough, but in the long-run can really help local businessese rise above their competitors in local search rankings. Do you agree with the experts? Let us know your thoughts on link building in the comments below.